On the fourth day of December I wore my love to see! Now you thought I was going to make it into a song again didn't you? Nope not today! SO what did I wear for my love to see well a Christmas dress. One as white as snow, a pair of red heels and I put out a Carousel that plays a melody. No song for today and a short post since I have been so side tracked today! Facepalm's outfit comes in two pieces the dress and the belt. The outfit also includes shoes. OXIDE comes both with armlets and circlet. In the photo I don't have on the circlet. The necklace is a FREEE gift! 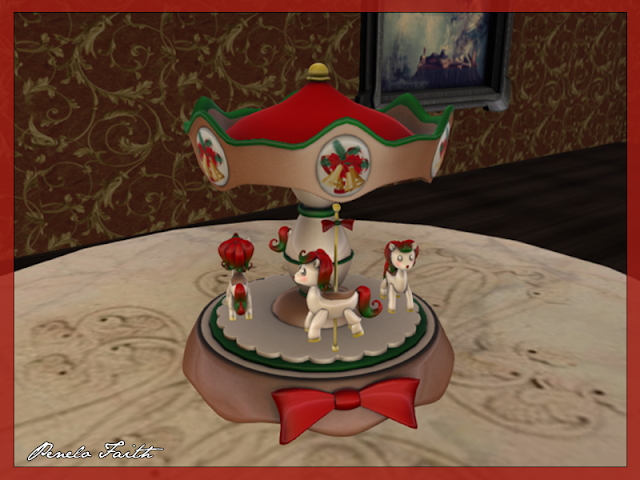 Vicarious Youth did an adorable job with the Carousel it actually plays music! It is a great gift for children, young adults and even the old people! There are several colors available. It is however a gacha item so may the odds ever be in your favor!